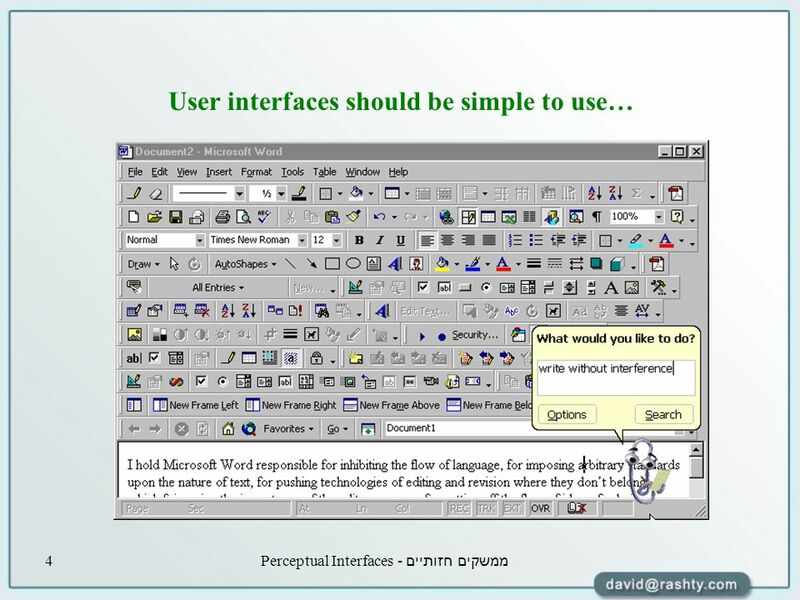 ממשקים חזותיים - Perceptual Interfaces1 Perceptual User Interfaces David Rashty. 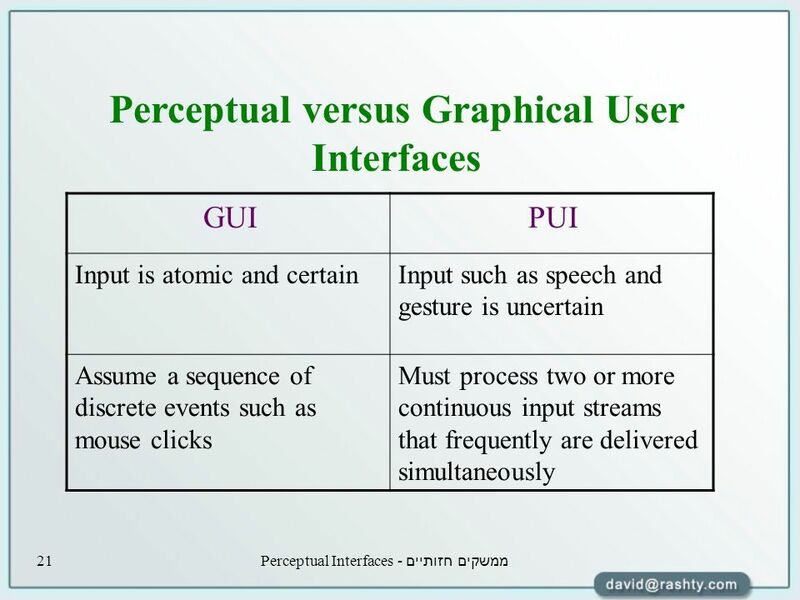 3 ממשקים חזותיים - Perceptual Interfaces3 User Interfaces A user interface is the junction between a user and a computer program. 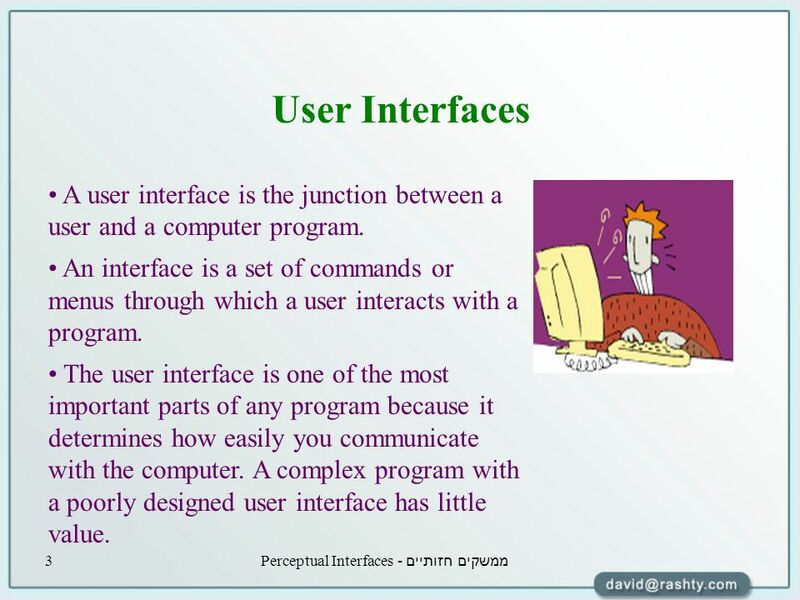 An interface is a set of commands or menus through which a user interacts with a program. 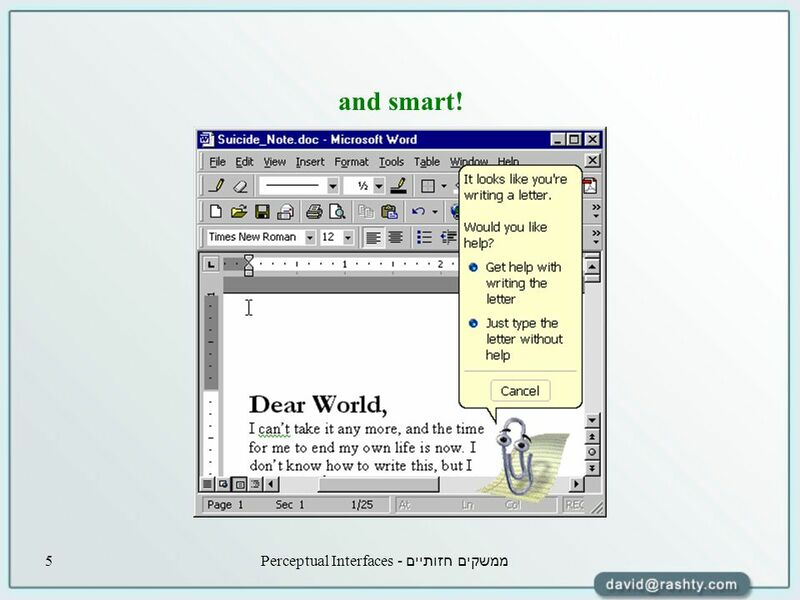 The user interface is one of the most important parts of any program because it determines how easily you communicate with the computer. A complex program with a poorly designed user interface has little value. 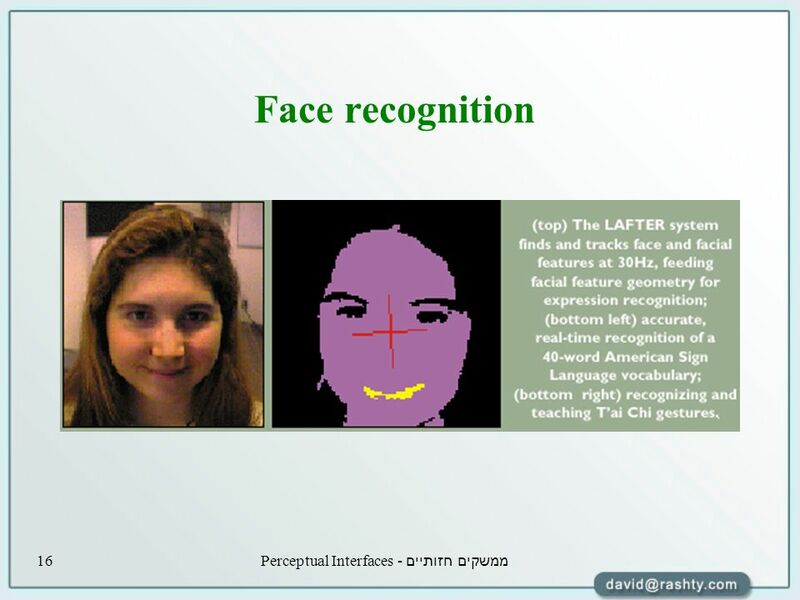 5 ממשקים חזותיים - Perceptual Interfaces5 and smart! 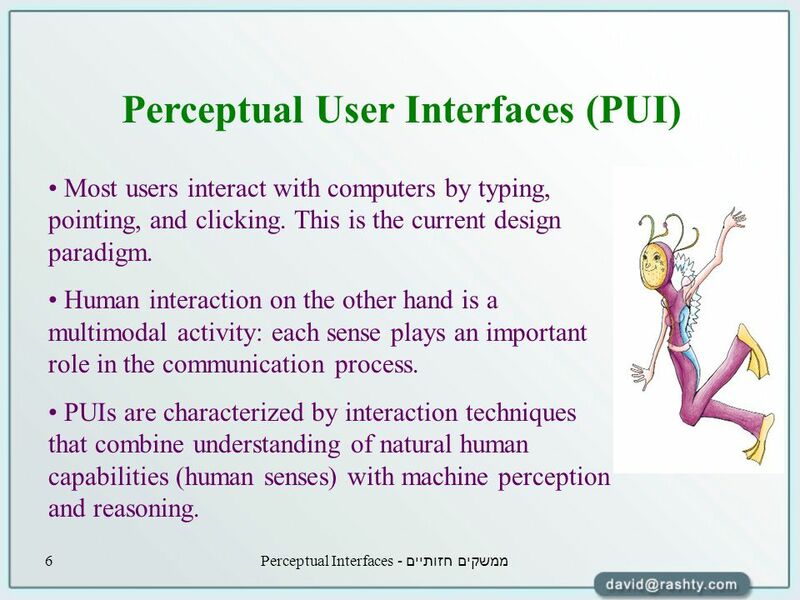 6 ממשקים חזותיים - Perceptual Interfaces6 Perceptual User Interfaces (PUI) Most users interact with computers by typing, pointing, and clicking. This is the current design paradigm. 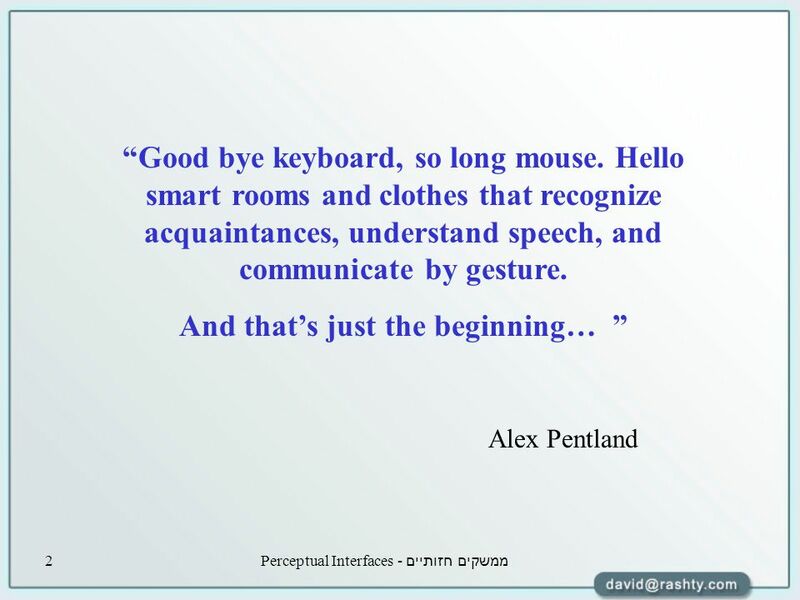 Human interaction on the other hand is a multimodal activity: each sense plays an important role in the communication process. 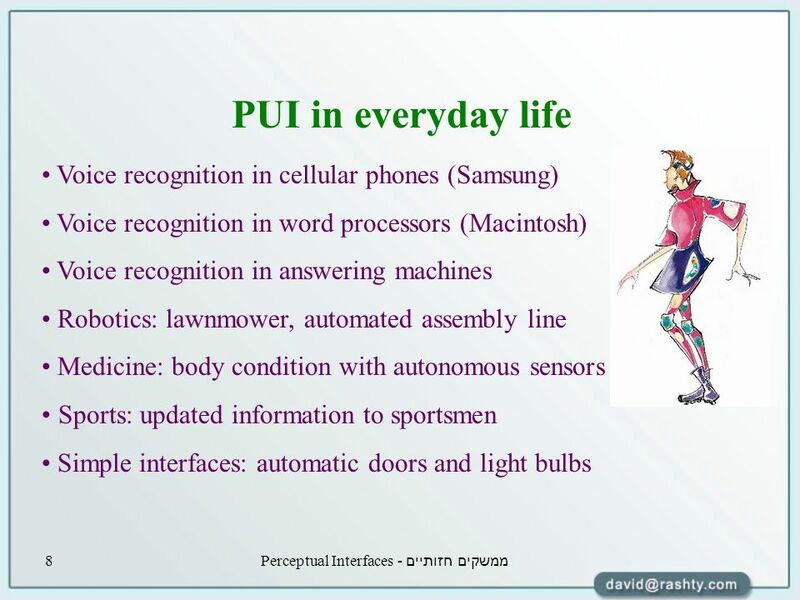 PUIs are characterized by interaction techniques that combine understanding of natural human capabilities (human senses) with machine perception and reasoning. 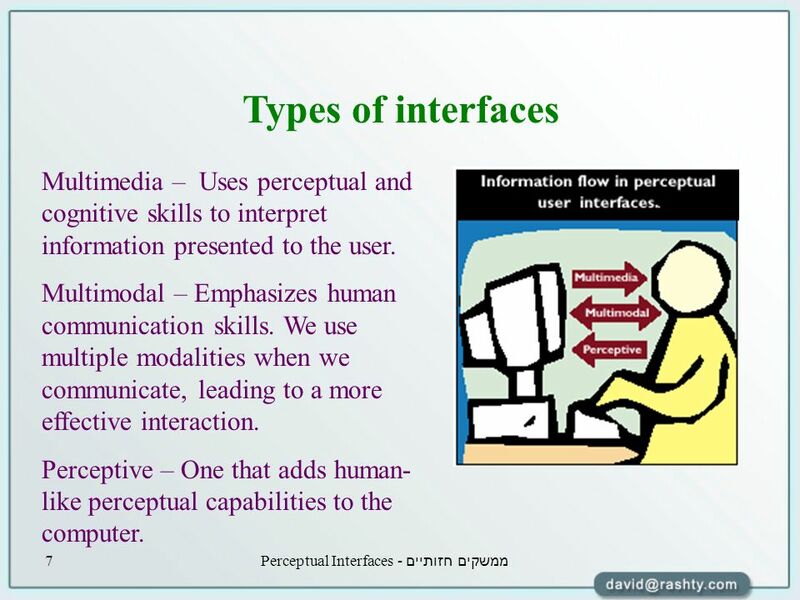 7 ממשקים חזותיים - Perceptual Interfaces7 Types of interfaces Multimedia – Uses perceptual and cognitive skills to interpret information presented to the user. Multimodal – Emphasizes human communication skills. We use multiple modalities when we communicate, leading to a more effective interaction. 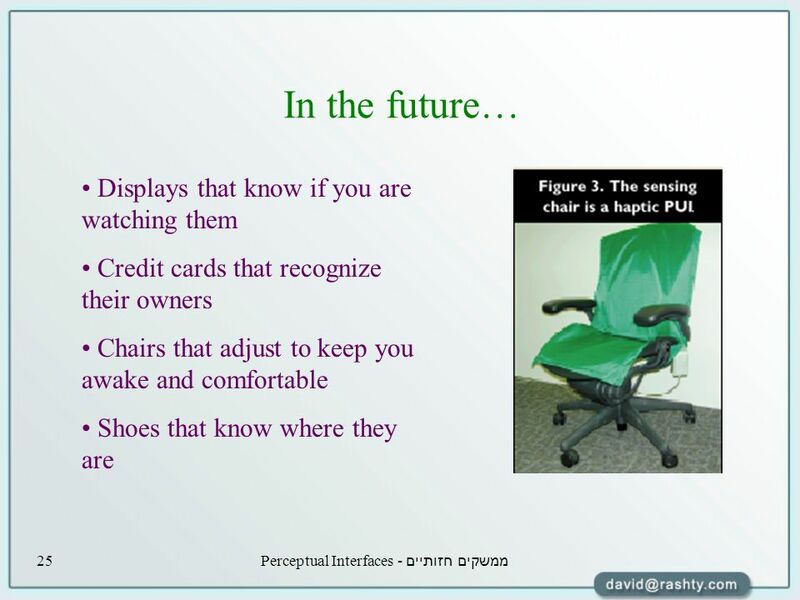 Perceptive – One that adds human- like perceptual capabilities to the computer. 10 ממשקים חזותיים - Perceptual Interfaces10 The Kids Room The KidsRoom is an automated and interactive narrative playspace for children. 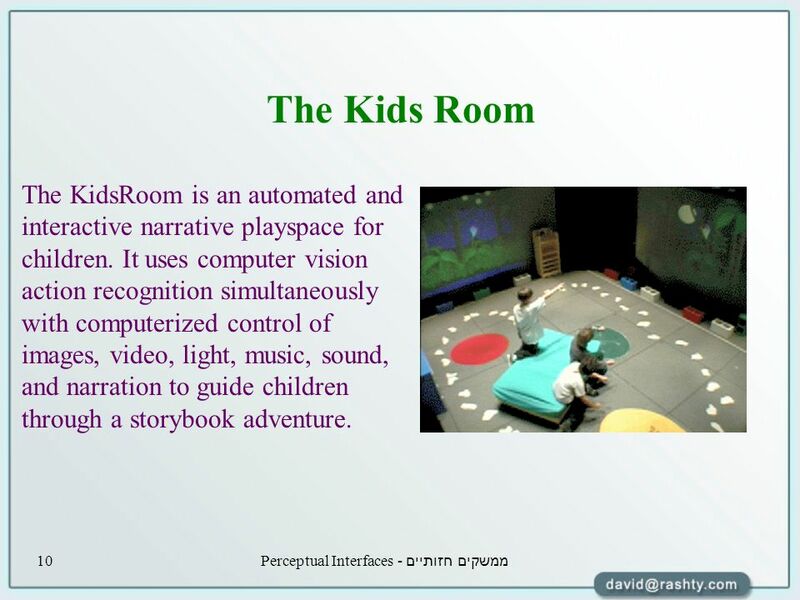 It uses computer vision action recognition simultaneously with computerized control of images, video, light, music, sound, and narration to guide children through a storybook adventure. 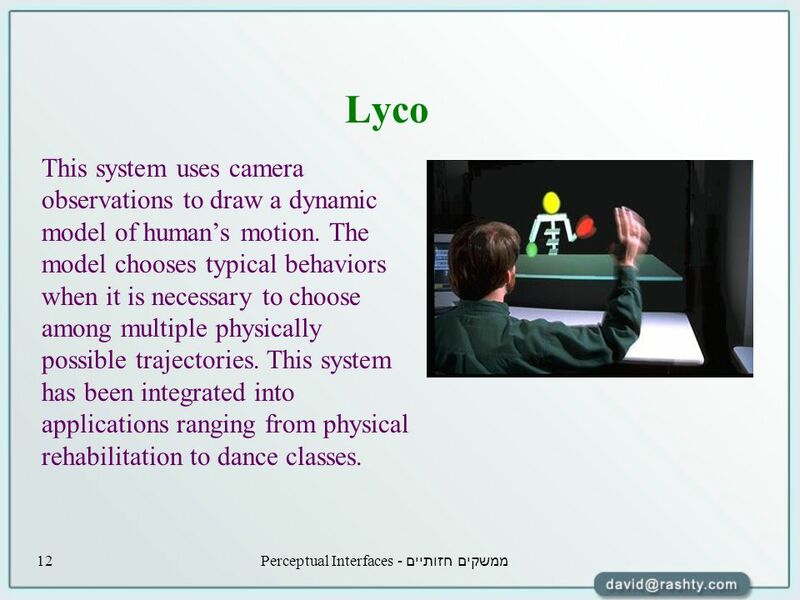 12 ממשקים חזותיים - Perceptual Interfaces12 Lyco This system uses camera observations to draw a dynamic model of human’s motion. The model chooses typical behaviors when it is necessary to choose among multiple physically possible trajectories. This system has been integrated into applications ranging from physical rehabilitation to dance classes. 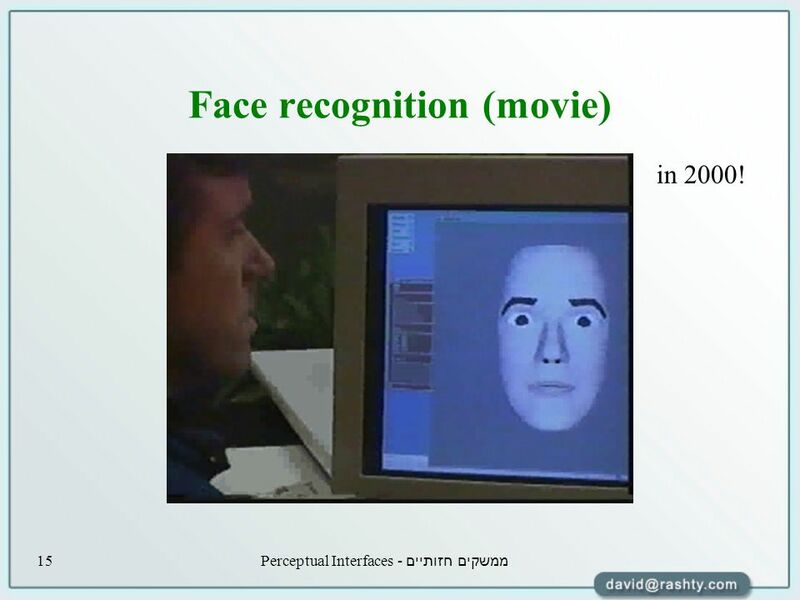 15 ממשקים חזותיים - Perceptual Interfaces15 Face recognition (movie) in 2000! 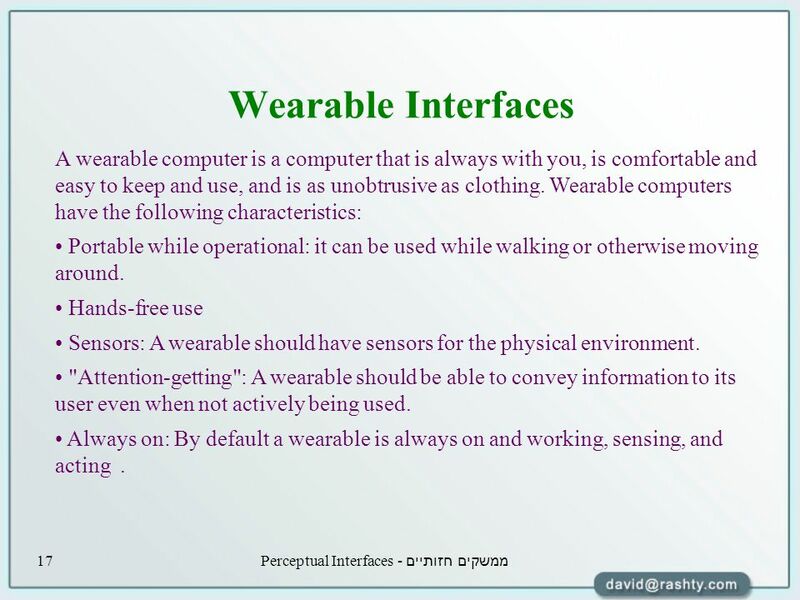 17 ממשקים חזותיים - Perceptual Interfaces17 Wearable Interfaces A wearable computer is a computer that is always with you, is comfortable and easy to keep and use, and is as unobtrusive as clothing. 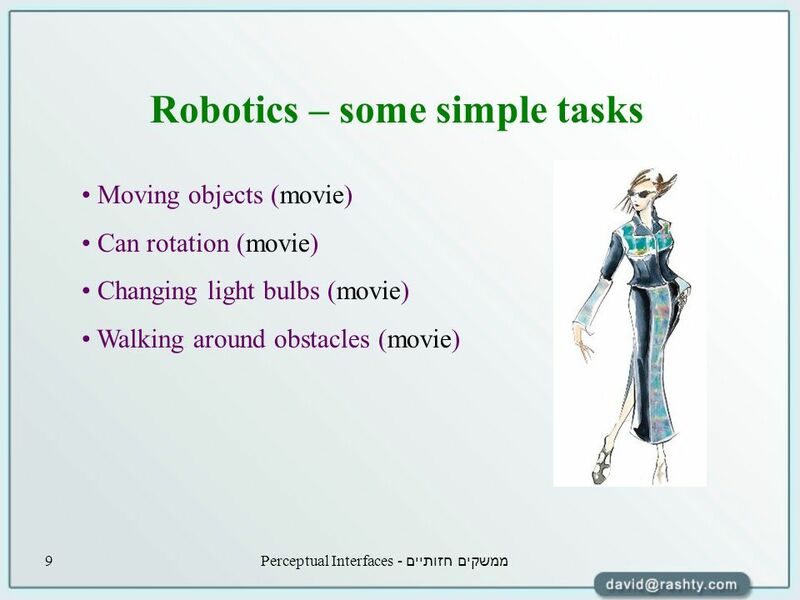 Wearable computers have the following characteristics: Portable while operational: it can be used while walking or otherwise moving around. Hands-free use Sensors: A wearable should have sensors for the physical environment. 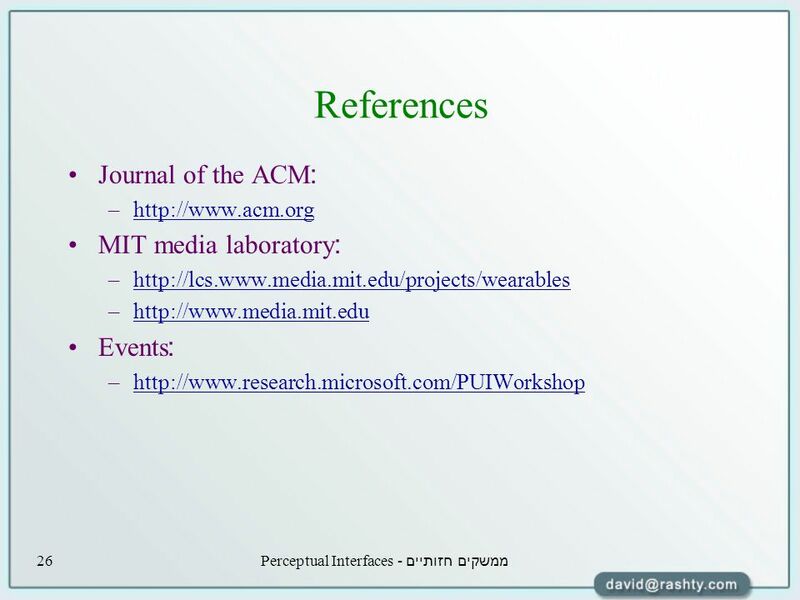 "Attention-getting": A wearable should be able to convey information to its user even when not actively being used. Always on: By default a wearable is always on and working, sensing, and acting. 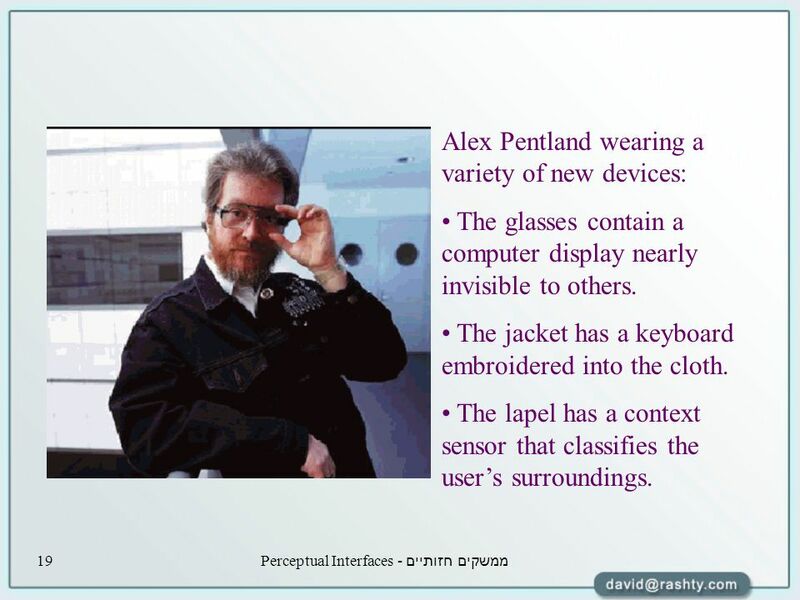 19 ממשקים חזותיים - Perceptual Interfaces19 Alex Pentland wearing a variety of new devices: The glasses contain a computer display nearly invisible to others. The jacket has a keyboard embroidered into the cloth. The lapel has a context sensor that classifies the user’s surroundings. 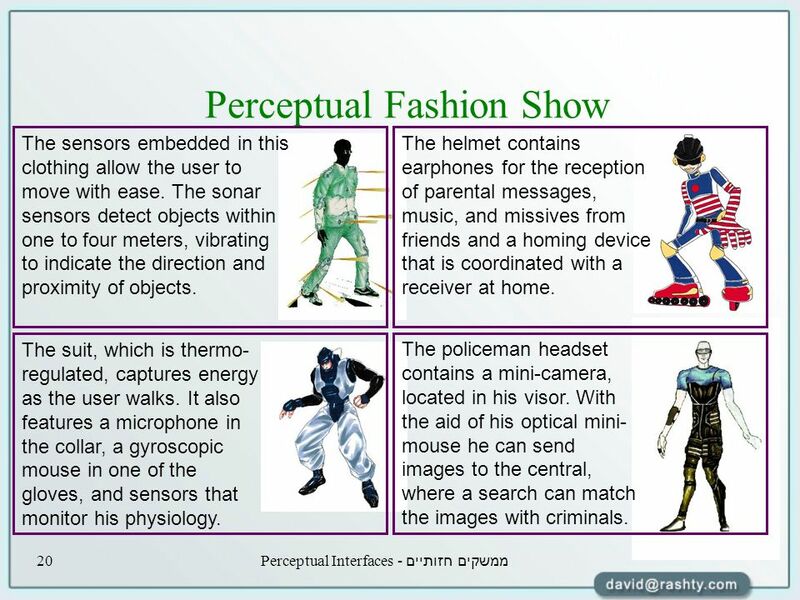 20 ממשקים חזותיים - Perceptual Interfaces20 Perceptual Fashion Show The helmet contains earphones for the reception of parental messages, music, and missives from friends and a homing device that is coordinated with a receiver at home. The policeman headset contains a mini-camera, located in his visor. With the aid of his optical mini- mouse he can send images to the central, where a search can match the images with criminals. The sensors embedded in this clothing allow the user to move with ease. The sonar sensors detect objects within one to four meters, vibrating to indicate the direction and proximity of objects. The suit, which is thermo- regulated, captures energy as the user walks. It also features a microphone in the collar, a gyroscopic mouse in one of the gloves, and sensors that monitor his physiology. 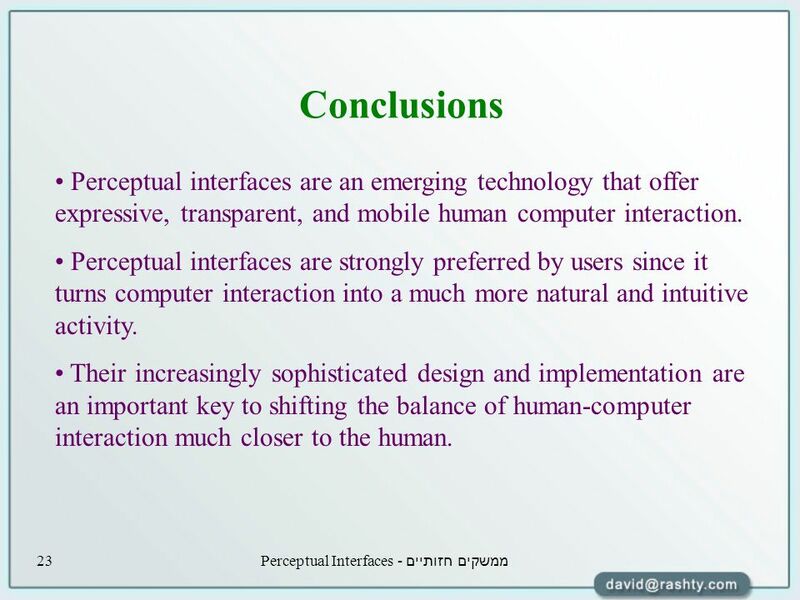 23 ממשקים חזותיים - Perceptual Interfaces23 Conclusions Perceptual interfaces are an emerging technology that offer expressive, transparent, and mobile human computer interaction. 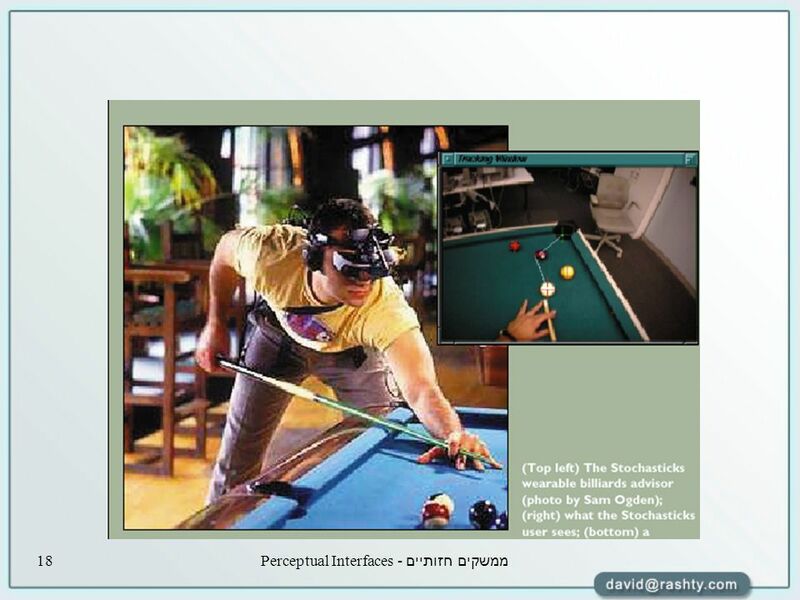 Perceptual interfaces are strongly preferred by users since it turns computer interaction into a much more natural and intuitive activity. 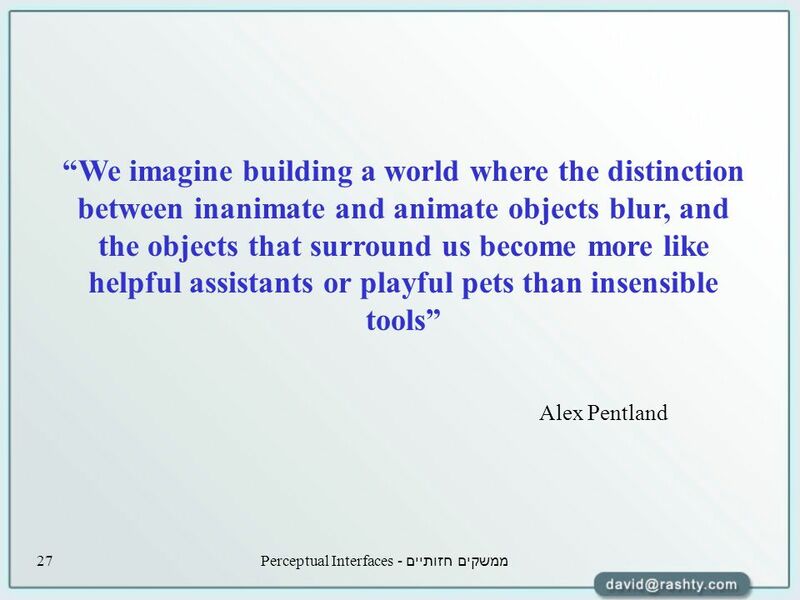 Their increasingly sophisticated design and implementation are an important key to shifting the balance of human-computer interaction much closer to the human. 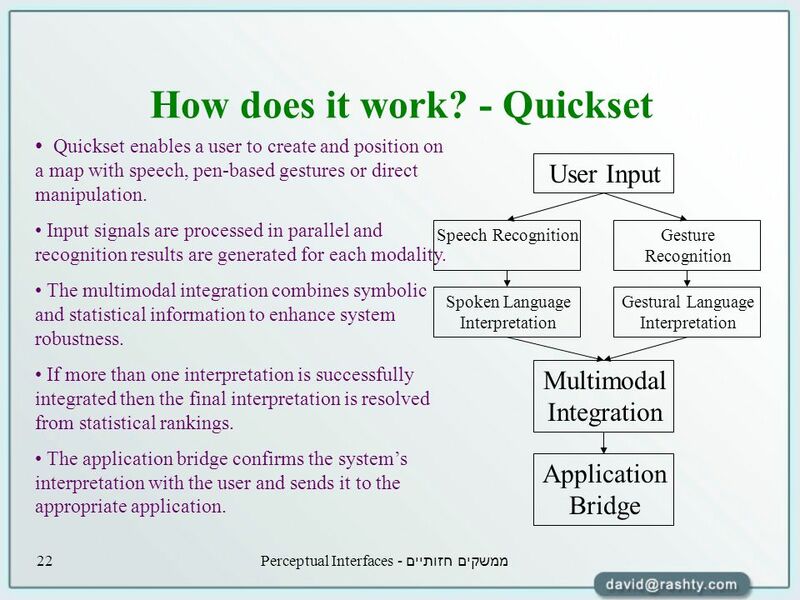 24 ממשקים חזותיים - Perceptual Interfaces24 Research directions Smart clothes, rooms, spaces Affective Computing A usable environment that understands the user’s needs and acts accordingly. 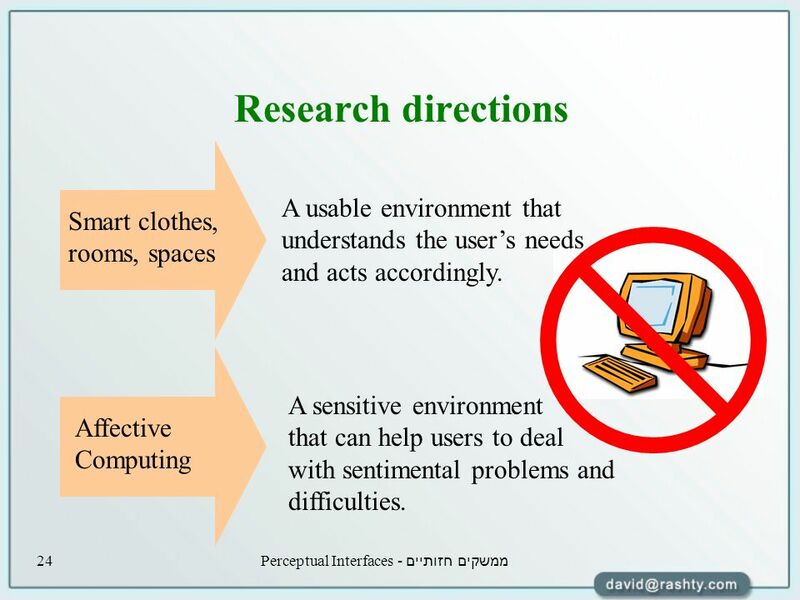 A sensitive environment that can help users to deal with sentimental problems and difficulties. 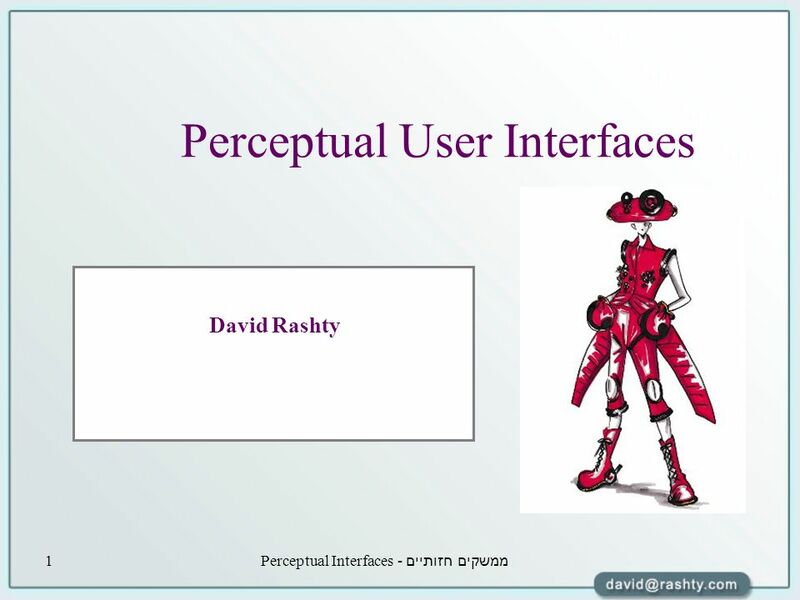 Download ppt "ממשקים חזותיים - Perceptual Interfaces1 Perceptual User Interfaces David Rashty." Automation of the home, housework or household activity. Linked systems/appliances to centralized control. Remote monitoring of the home from a tabletop. Teaching and Learning with Technology  Allyn and Bacon 2002 Digital Technologies in the Classroom Chapter 4 Teaching and Learning with Technology. Virtual Reality Design Virtual reality systems are designed to produce in the participant the cognitive effects of feeling immersed in the environment. Input Devices. What is input? Input refers to the process of entering data, programs, commands and user responses into memory Programs are sets of instructions. 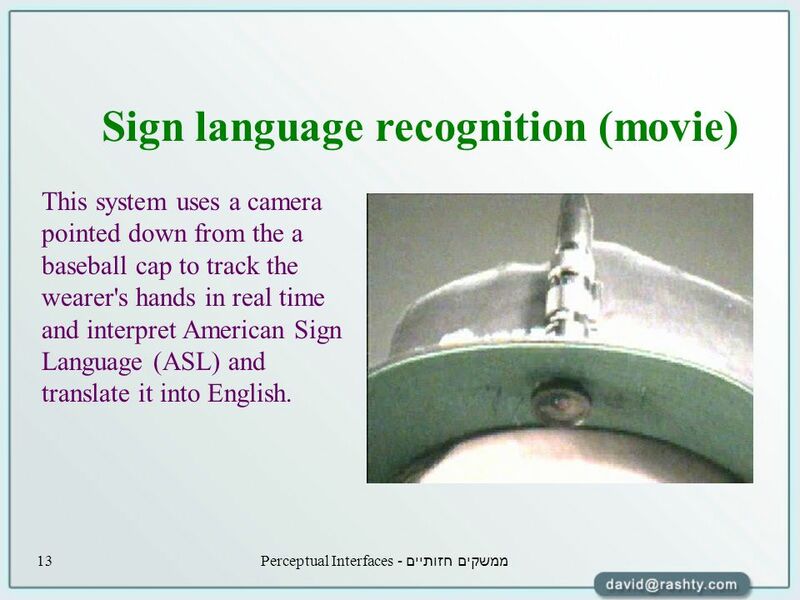  INTRODUCTION  STEPS OF GESTURE RECOGNITION  TRACKING TECHNOLOGIES  SPEECH WITH GESTURE  APPLICATIONS. 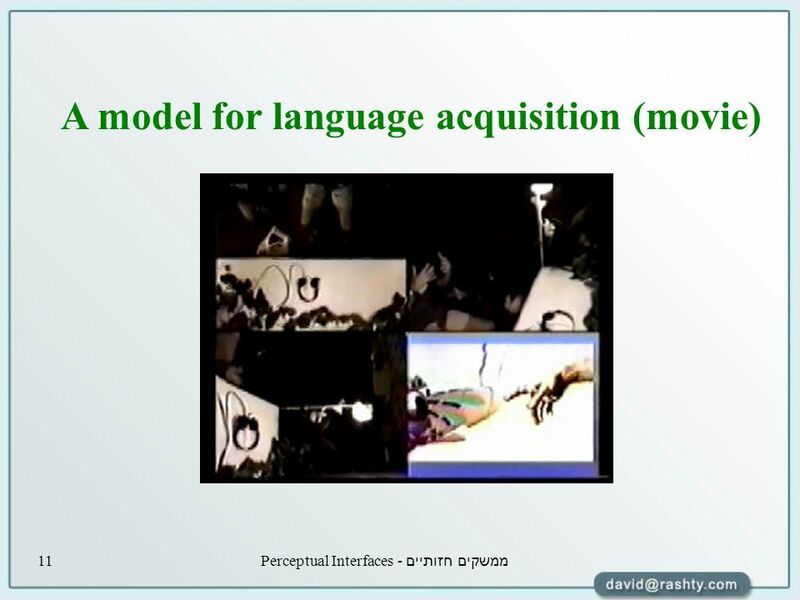 Lesson 4 Alternative Methods Of Input. 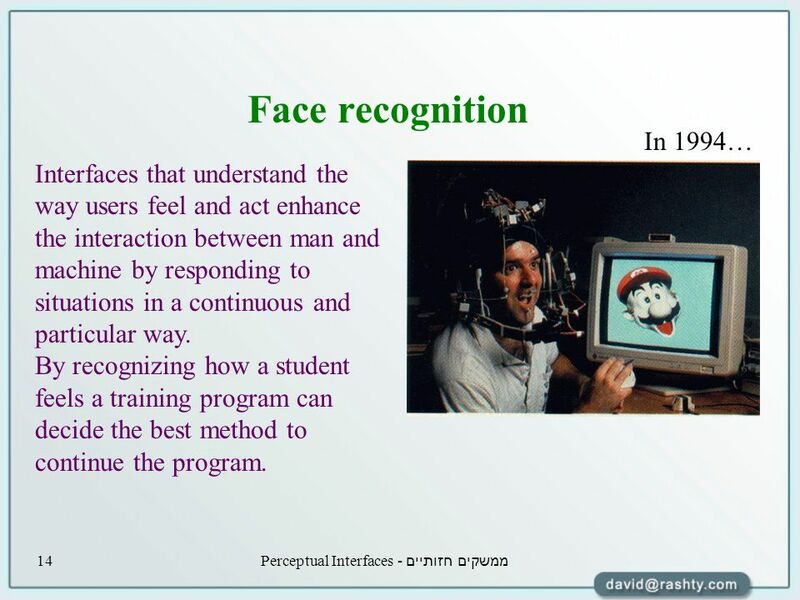 MIND READING COMPUTER Presented By, Judy Francis. Ch 7 & 8 Interaction Styles page 1 CS 368 Designing the Interaction Interaction Design The look and feel (appearance and behavior) of interaction objects. CS335 Principles of Multimedia Systems Multimedia and Human Computer Interfaces Hao Jiang Computer Science Department Boston College Nov. 20, 2007. New Technologies Are Surfacing Everyday. l Some will have a dramatic affect on the business environment. l Others will totally change the way you live. Input Devices Text Entry Devices, Positioning, Pointing and Drawing. Virtual Reality Virtual Reality involves the user entering a 3D world generated by the computer. To be immersed in a 3D VR world requires special hardware. Adapted from CTAE Resources Network PROFITT Curriculum Basic Computer Skills Module 1 Hardware. Input Devices.  Identify audio and video input devices  List the function of the respective devices.